1: 119 not out v. England at Old Trafford, August 1990. Match drawn. 2: 114 v. Australia at Perth, 1992. Australia won by 300 runs. Having six months earlier become the youngest to score a Test century on English soil, Tendulkar now set the record for Australia – that too on the lightning quick WACA wicket. It is a century he still rates as one of his finest and followed his 148 not out at Sydney two Test matches earlier. 3: 155 not out v Australia at Chennai, March 1998. India won by 179 runs. The MA Chidambaram stadium at Chepauk, Chennai has been the scene of some his best innings, including his first century on home soil against England in February 1993. Australia under Mark Taylor’s captaincy were thirsting to become the first Australian side to win a series in India since 1969-70. They had in their ranks master leg spinner Shane Warne who bad by now become recognized as the best in the world. After failing in the first innings, Tendulkar came good just when India were chasing quick runs for a declaration. They did so at 414 for 4 and Australia folded up in their second innings. “One of the greatest batting exhibitions of modern times,” wrote journalist Dicky Rutnagur. 4: 136 v. Pakistan at Chennai, January 1999. Pakistan won by 12 runs. Arguably his finest century at home but one that went in vain as Pakistan won a thriller. Out for a duck in the first innings, he was in sublime form in the second with India chasing 271 to win the first Test. 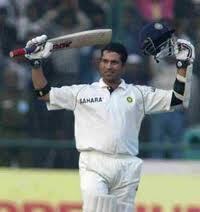 At 82 for 5 it looked all over till Tendulkar found support in Nayan Mongia as they added 136 runs. Battling severe back pain, Tendulkar watched in anguish as the rest of the batting folded up after his dismissal and India conceded defeat. 5: 126 v. Australia at Chennai, March 2001. India won by two wickets. India had stormed back to win the second Test at Kolkata after losing the first at Mumbai to Steve Waugh’s world champions. Now it came down to the decider. His 126 in the first innings helped India take a vital first innings lead that would prove decisive in a tight finish. It was his 25th Test ton. 6. 155 v. South Africa at Bloemfontein, November 2001. South Africa won by nine wickets. This was a dazzling century in a losing cause. Tendulkar shared a double century stand in the first innings with debutant centurion Virender Sehwag which however could not prevent the rout. Tendulkar became the youngest to cross 7,000 runs in his 85th Test during this innings as he raced to his century from just 114 balls with 23 fours and a six. 7. 193 v. England at Headingley, August 2002. India won by an innings and 96 runs. This was Indian batting at its most glorious with Rahul Dravid, Sourav Ganguly and Tendulkar all piling up centuries in the same innings for the first time as India totalled a mammoth 628 for eight declared. Standing head and shoulders above the rest was Tendulkar with his highest score in England on his third tour. It was his 30th Test century, taking him past the iconic Don Bradman. Tendulkar and Ganguly flayed the English bowling to the tune of 96 runs from the last 11 overs of the second day. England’s bowlers could scarcely believe they were being collared at their favourite ground. 8: 241 not out v Australia at Sydney, January 2004. Match drawn. Tendulkar had been going through a horrible run in the series and was determined to make amends in the final Test with the series locked at 1-1. It was his longest innings and a supreme example of self-denial as he eschewed almost every shot on the off side. His double ton was the highest of his career at the time and allowed India to cross 700 for the first time in Australia. He followed it up with 60 not out to cross a total of 300 runs for the first time in a single Test. 9: 103 not out v. England at Chennai, December 2008. India won by six wickets. This one was extra special, a match soaked in emotion and full of symbolism. England had agreed to return to the Test series in India just weeks after the horrors of 26/11. The venue for the first Test was shifted from scarred Mumbai to Chennai and now for only the fourth time in his long career, Tendulkar scored a century in the fourth innings. But for the first time it was in a winning cause and he reached the target and his century with a flashing boundary to unite the country in joy just after its darkest hour. 10: 146 v. South Africa at Cape Town, January 2011. Match drawn. India had been thrashed in the first Test of the series which was marked by Tendulkar’s 50th Test ton. But India stormed back to win the second Test and the teams were locked 1-1 going into the third and final match. Though Jacques Kallis stole the thunder with centuries in both innings, it was Tendulkar?s stirring duel with fast bowler Dale Steyn who put in a spell of high quality swing bowling at fiery pace. Tendulkar played and missed on numerous occasions but stuck it out to carve a memorable century and help India draw a series for the first time on South African soil.